It seems we live in a world where everything is possible. And if it’s not possible yet, it will be. We use phones that have more computing power than the computers that went to the moon with the Apollo missions. We watch movies with special effects that look so real we forget they’re not. Unless you’re watching a movie on SyFy – but that’s only what I hear (clears throat). Many of the sicknesses that used to plague the world are cured with a preventative shot. A trip across the country that used to take months, then took days and now only takes hours. And perhaps most amazing of all, this huge world that used to be round is now flat. And yet, many of us still face situations for which there is no easy answer. There is no cure for cancer. The economy is still in the tank and many out of work. Hurricanes cannot be stopped, Earthquakes still destroy, Tsunamis roll and people kill. Our progress has made us more impatient than ever, even when waiting for the impossible. And yet, for some things there is no advancement great enough to conquer. We would wait for centuries, but there will never be a solution. So we dream of all the impossibilities being absolved with one simple solution. Some fairy dust we can sprinkle that will make everything better. Three wishes. The Lottery. True Love. And perhaps, therein, the problem doth lie. (How’d you like that new world english?) We live in a world of actual impossibilities. There are things that will never happen and no amount of advancement will make the impossible – possible. We will never be able to stop a Hurricane from forming, or the earth’s crust from cracking. We will experience pain and suffering. That’s the reality. There is no magic that can be sprinkled to protect us from it. And even if there was, the magic we dream about is only enough to save us from one situation. If only there was something greater than magic. There are wrongs that cannot be overcome with good. Wrongs we will never understand, nor be able to explain to our kids. But there is hope. Perhaps this is why we find Jacob hoping for salvation in Genesis and Paul hoping for a clarity yet to be seen in Corinthians. (Along with many other references for hope in between.) 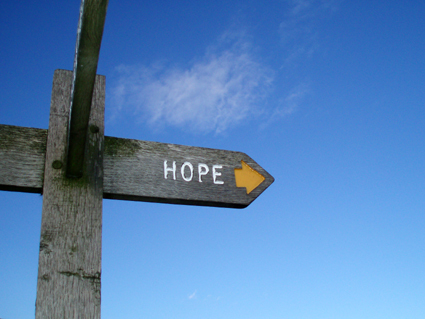 Hope is one of just a few universal continuities. Every one hopes. This is the hope that we have. Hope is the real magic. Magic solves the problem for me…hope, for all mankind. Magic is temporary…hope, eternal. Magic can be undone…hope, permanent. Hope is what we have. It does not put food on the table, money in the bank or a 401(k). But, we can hope that things will change and that there will be a day in this life where those changes take place. But, even beyond that, we have hope. We have hope for an existence beyond now where this now we live in will make sense. We will see clearly, know fully and be completely. It may never make sense now, but we have the hope that it will. We have the hope that all injustices will be undone. We have the hope that all hurt and heartache will be gone. Hope. There are greater things, but hope ranks in the top 3. It certainly out-ranks magic.